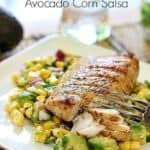 Easy and simply prepared Grilled Mahi with a crunch corn and avocado salsa! Fast, Fresh and Healthy! Combine all ingredients in a large bowl. Chill while fish is grilling. Heat indoor or outdoor grill to medium high. In small dish, combine olive oil, cumin, chili powder, salt and pepper. Brush on to uncooked mahi fillets. Grill about 4 minutes on each side (depending on thickness of the fillet), until cooked through to an internal temp of 145 degrees and fish flakes easily. TIPS TO MAKE THIS GRILLED MAHI WITH CORN AND AVOCADO SALSA! 1. Use fresh corn removed from the cob. Do not precook the corn...the crunch is the beauty of this salsa. 2.) Grill your fish indoor or out. 145 internal temp is fish perfection! 3.) Add all your favorite veggies to the salsa. We love zucchini, tomatoes and a minced jalapeño if you want more heat! 4.) Use boneless chicken in place of the fish. Grill to 165 degrees internal temp.